Lime e-scooters will be removed from Adelaide city footpaths by the end of the week because the firm failed to enforce council-imposed geographic boundaries, InDaily can reveal. InDaily this morning revealed that the council has asked Lime to remove all its e-scooters from city streets after two of its competitors successfully bid for the new permit. Lime’s 500 e-scooters will be removed by Sunday and replaced with e-scooters produced by two other companies. In a confidential email to councillors last night, obtained exclusively by InDaily, council director of operations Beth Davidson-Park said Lime had declined to force its e-scooters to slow to a stop if they go outside of a set of council-imposed boundaries. “Lime’s e-scooter was not able to come to a stop when entering a prohibited or restricted area, it demonstrated that the e-scooter could reduce to a speed of 4km/h but users would still be able to ride the e-scooter at a walking pace,” the email reads. “Lime indicated that it would not stop its e-scooters in restricted areas, based on Lime’s own safety reasons. Davidson-Park’s email – which stresses “this information is not publicly available and should be treated as confidential” – says Lime was able to meet “the majority of evaluation requirements but (its) submission did not provide all requested information and so, together with the inability to meet the required performance in the demonstration, did not meet the requirements of the EOI”. The council expects Lime to remove all of its scooters by midnight on Sunday, threatening fines if the company fails to comply. The email says a press release about the decision will be distributed today, and that the council expects “media interest”. The council distributed a media release after InDaily contacted the administration for comment this morning. Lime Asia Pacific director of government affairs Mitchell Price told InDaily Lime was “extremely disappointed” in the decision and called on the council to urgently review it. He said the council had run an “unfair” process and that no e-scooter operators should be allowed to be on Adelaide’s streets on Monday until the decision is reviewed. Price argued that Lime was the only company that applied in the expressions of interest process with enough experience to effectively manage e-scooters in Adelaide. The safety of the people of Adelaide has been put last. He also objected to the decision, which was recommended by a panel of two council employees and two state government employees, was signed off by Davidson-Park because she was soon leaving the council – as InDaily revealed earlier this month. Price said Lime had spent millions of dollars, and employed 30 operations staff and 200 “juicers”, who charge the e-scooters – and all would now lose their jobs. He also claimed stopping e-scooters that breach the geo-fence was unsafe and likely to cause accidents. “The safety of the people of Adelaide has been put last,” he said. In a statement released late this morning, Lime said the initial trial had resulted in more than 144,000 rides and 41,000 riders. However, InDaily understands the council required the scooters to slow to a stop when taken beyond the geofence, rather than abruptly stop. The decision was recommended by a four-person panel, including two representatives from council administration and two from the Department of Planning, Transport and Infrastructure, and officially approved by council CEO Mark Goldstone, using powers delegated from the council. 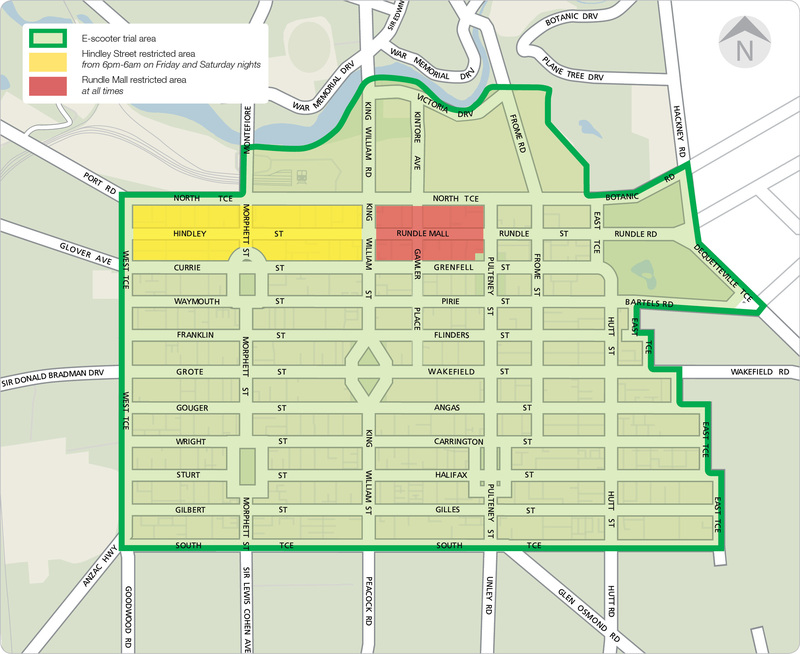 Price told the ABC in January, before the festival season trial began, that the company’s e-scooters would warn users against breaching the geofence. “There’s a geo-fence so the user won’t be able to end the trip, so they’ll be continually charged or a warning message will be given through the app that they have to return it through the geo-fence zone,” he is quoted as saying. Lime’s 500 e-scooters will be replaced by 250 produced by Melbourne-based company Ride and another 250 produced by Singapore-based company Beam. Ride and Beam will begin distributing their e-scooters around the CBD on Monday. The Melbourne-based company will be collaborating with local small business EcoCaddy and a local battery manufacturer as part of its operations, according to the confidential email. Ride’s scooters are customisable and according to the email, “considered to be more user friendly than other operators, with a lower centre of gravity, rear wheel drive and brakes, wider handle bars and adjustable steering column height”. It also met all permit conditions including geofencing. Council director of operations Beth Davidson-Park told InDaily the council welcomed the new operators and that they “put forward a stronger expression of interest” than Lime and another shortlisted but ultimately unsuccessful company, Neuron. “They met the requirements for on the request for (expressions of interest) on all points and therefore they were successful,” said Davidson-Park. She declined to discuss why Lime failed to meet the evaluation criteria, telling InDaily, “that information is still commercial in confidence”.